Ron started his floor covering career over 40 years ago, initially working retail and then distribution. After a successful career at Mohawk Industries serving as executive vice president of residential sales, Ron founded CarpetsPlus in 1997 with Jon Logue. Ron enjoys networking best business practices and proven ways with store owners and entrepreneurs from all different industries. In addition to authoring a book and serving on several boards, Ron also founded One Thing, an Atlanta-based ministry for business men. Ron graduated with a BA from Trinity University in Deerfield, IL, and in 2010 was honored as their Alumnus of the Year. He and his wife Sandy have two grown children and three grandchildren. Ron enjoys his mountain bike, following his favorite sports teams and a good round of golf. He is from Milwaukee, WI and now lives in Alpharetta, GA with his wife Sandy. Ryan serves Alliance as our co-COO & Vice President of Sales. He excelled at college and semi-pro baseball before pursuing a career in the flooring industry. He became a certified carpet installer, then sold at retail while still installing. 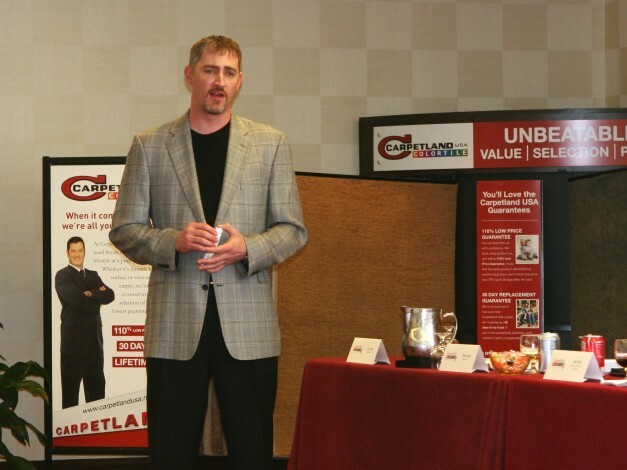 Before he joined CarpetsPlus in 2000, Ryan traveled the west coast visiting 100’s and 100’s of stores, spearheading a Retail Groups Initiative (RGI) to help carpet centric stores assimilate into hard surface. Today he and Kevin work together bring initiatives to help members diversify into new sales and profit building categories. In 2012 Ryan founded One Thing for Youth to help aspiring gifted athletes instill core values and life skills through the game of baseball. Ryan is originally from Milwaukee and now lives in Alpharetta, GA with his wife Christy and their two sons. Kevin Logue graduated from Tulane University in New Orleans with a BA in Mass Communication in 1993. During college, he was an accomplished drummer and radio disc jockey. After a successful career in television news and digital media production, Kevin began his career in the flooring industry in 1998 with American Flooring Consultants as Director of Operations. He subsequently joined CarpetsPlus of America in 2000, as Director of Marketing and now serves as Vice President of Marketing. Kevin is originally from Richmond, Virginia and now lives in Signal Mountain, TN with his wife, Jenni, and his three sons. The Advisory Board is a select group of members chosen from across the country, representing both small and large CarpetsPlus COLORTILE retail stores. Before we develop or launch a new program, we get their input. Everyone’s opinions are valuable and shape many of the decisions the company makes. The Buying Committee meets once a year and provides input on strategies for merchandising, products and roll stocking programs. This focused group of members represent different areas of the country to provide the best mix possible.